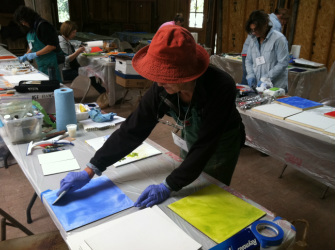 During our week at Ghost Ranch, we will be exploring the world of oil paint, cold wax, abstraction and layers. The mornings there will be instruction and time to paint. In the afternoons, more painting and time to explore the ranch. As a group, we visit White Place, hike to Chimney Rock (optional) or individually soak in the landscape and spirit of ghost ranch. Week-long workshop in a beautiful setting! Registration is open! "Cindy is a master artist and generous teacher; sharing her wealth of skills, knowledge, ideas, and inspiration through clear explanation and demonstrations. She encourages spontaneity, playfulness, and experimentation, while providing a solid grounding in artistic principles. Cindy creates a fun, relaxed environment with plenty of time for independent exploration and one-on-one instruction. I learned so much in this workshop and had a blast! 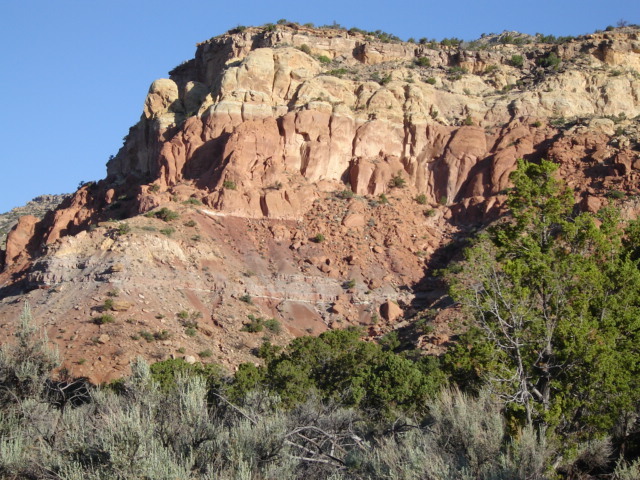 Working in the spectacular setting of Ghost Ranch is like a dream come true! " Ghost Ranch in New Mexico. Cairn Morrison and others discussing finished work during Ghost Ranch week 2013. Cold wax and making layers.